3 Bedroom Terraced House For Sale in Walsall for Offers Over £130,000. Must Be Viewed, No Upward Chain, Renovated Property!! 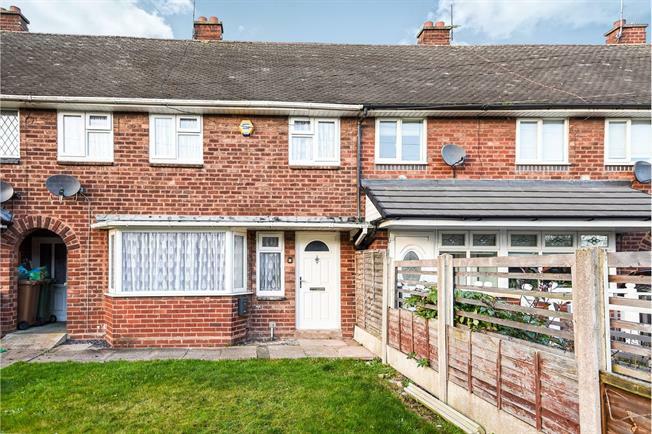 A great opportunity to purchase a refurbished terrace property situated on Glastonbury Crescent Mossley Estate Bloxwich in reach to bus routes, road network, Bloxwich north train station, shops, schools and amenities. The property in brief comprises of hallway, lounge, re-fitted dining kitchen with hob, oven, extractor and space for appliances and leading to side lobby. On the first floor are three bedrooms, re-fitted bathroom and wc. The property benefits from double glazing and central heating, outside front and rear gardens. Re-fitted dining kitchen, two windows to rear and door to garden. A range of wall mounted cupboards and base units, drawer units, space for appliances, work surfaces incorporating sink and drainer unit, hob, oven, stainless steel extractor, tiling to splash backs, floor and radiator to wall.